CD review: "Shame + A Sin"
This review first appeared in the September 10, 1993 issue of the North County Blade-Citizen (now North County Times). 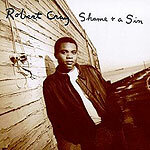 Robert Cray's new album, "Shame + A Sin," is much closer to his early recordings on the independent HighTone Records than the hit-machine formula he adopted for awhile after moving to Mercury. The music here is bluesier, less rock-oriented; the songs slower, more introspective. Cray's musicianship remains top-notch, with his guitar work just as biting; his singing is as impassioned as ever. And for the first time in several albulms, Cray seems to be enjoying himself. Maybe it's only now, after a string of hits, that Cray is able to relax and start achieving the artistic promise hinted at on his early sides.